You can get rebar from countless suppliers. But plain, stock rebar isn’t very useful—when was the last time you used an untouched piece of long stock rebar on a project? Most projects require rebar that is cut to length, bent, spiraled, or otherwise fabricated. PJ's Rebar can provide the rebar you need AND cut and bend it to your exact specifications. We have the equipment and the know-how to deliver fabricated rebar to match even the most complex requirements. To cut rebar to length, we utilize three RMS shear lines with computer optimization capabilities that help minimize scrap and reduce your material costs. We shear cut 20’, 30’, 40’, and standard 60’ bar stock in a range of sizes and grades to meet the needs of your project. • Anything your project requires! With three automated spiral bending machines, we can turn coiled rebar into spirals as small as 6” in diameter and as large as 10’ O.D. All our shear cutting and bending processes are performed in-house by our skilled, experienced team. 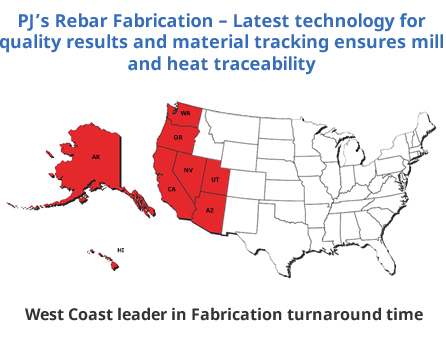 With these and other rebar fabrication services available under one roof, you’ll save valuable time and money on your project. 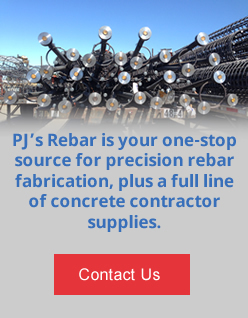 PJ's Rebar is the single-source, full-service supplier you need for shear cut, bent, and fabricated rebar. Request a price quote today, or contact us for more information.